Suddenly, Thomas Edison had an idea. When Thomas A. Edison developed an incandescent electric lamp in 1879, cartoonists rejoiced. They now had a way to depict a character having a good idea — the lightbulb-over-the-head symbol. Until then, artists were stuck with gas lamps or candles, which didn’t convey a bright idea nearly as well. 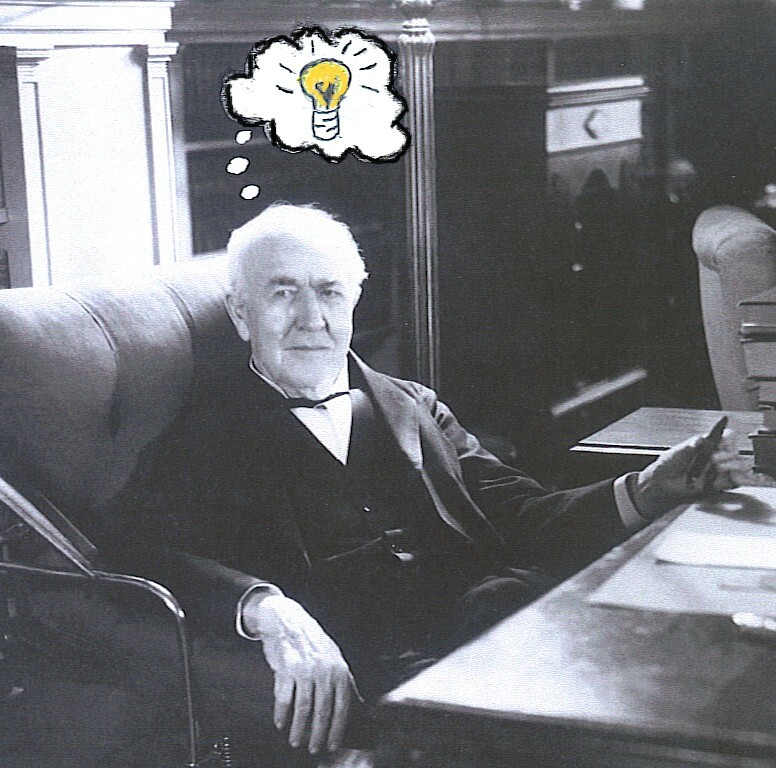 Edison himself had a lot of bright ideas in addition to the lightbulb, including the phonograph, the motion picture projector, alkaline storage batteries and a vote-counting machine. The term genius gets thrown around rather casually nowadays, applied by proud parents to children who have learned to tie their own shoes by age 12. There’s no dispute, however, that Edison was an authentic genius; he had a total of 1,093 patents, many of which proved to have practical value. He also had some terrible ideas. For instance, he blew a fortune trying to invent mining equipment that could separate iron from lower-grade ore. It’s also hard to comprehend how someone as smart as Edison could come up with the notion of poured-concrete houses. In a wonderful book called At Home, author Bill Bryson describes the demented dream behind the formation of the Edison Portland Cement Company in 1899. “The plan was to make a mold of a complete house into which concrete could be poured in a continuous flow, forming not just walls and floors, but every interior structure…” Yes, Thomas Edison envisioned a home that had concrete cabinets, concrete toilets — even concrete beds. Those of us with little or no engineering aptitude still can’t help but see that it would be awkward (at the very least) to construct molds that are the size of… well, a house. Sooner or later, it might also occur to us that a home made of concrete, filled with concrete furniture, might have a weight problem. Edison seems to have ignored estimates by engineers that these dwellings would weigh about 225 tons, which would create some serious strains on the structure. Or, if installed on certain sub-soils, would eventually sink. Once construction began, an even bigger obstacle became apparent. Edison’s engineers had a terrible time getting the liquid concrete to the right consistency; it had to be fluid enough that it would flow into every part of the giant mold, but not so runny that it settled and hardened into a blob. By 1912, the dream of pouring concrete houses and filling them with concrete pianos was abandoned, but a few of them were actually built, and there are people in New Jersey and Ohio who can still show you the concrete house where great-grandma lived. The most famous structure made from Edison cement does not bear the inventor’s name, though. For generations it was referred to as “The House that Ruth Built”, or known by its official name — Yankee Stadium. For that project the concrete was poured in manageable sections, of course, and none of the furnishings were made of concrete. Although from time to time, some Yankee fans still insist that the umpires are blockheads. This entry was posted in History, Science and tagged concrete houses, Thomas Edison. Bookmark the permalink. Reminds me of my cousin who dreamt of painting like they did at the beginning of some Disney opening sequences. They would run the brush across the top of the scene and the resulting drippings would depict a photo realistic landscape.